Description: New genuine Acer desktop computer cpu fan. 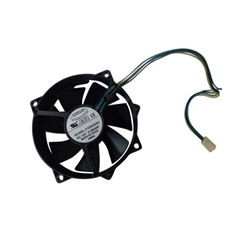 This fan may be the replacement part you need if your computer is overheating or shutting down. This is only the fan. You must use your existing heatsink. Compatible Part #'s: F129025SU, HI.10800.028, HI.10800.012, TMDC7, WK094Z, WK0842. Acer Aspire X1200, X1300, X1301, X1420, X1420G, X1700, X1800, X3100, X3200, X3300, X3400, X3400G, X3810, X3812, X3910, X5300, X5810. Acer Veriton X270, X275, X480G, X488G. Gateway SX2300, SX2311, SX2800, SX2801, SX2802, SX2803.